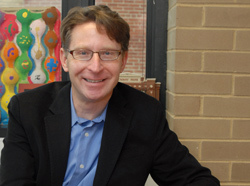 Jeffrey J. Cohen, chair of GW’s English Department, leads the University’s Medieval and Early Modern Studies Institute. together faculty and students in history, English, French and Italian to foster new research, exchange ideas and strengthen partnerships between GW and other scholarly organizations. MEMSI scholars are engaged in myriad topics of study spanning the sixth to 18th centuries, including community formation, violence and cultural differentiation, consumption and trade, and the interactions among Christians, Jews and Muslims. the Shakespeare Theatre and the University of Maryland. English Department and MEMSI director. response and made clear the need for an institute housed at GW. Last November, more than 60 scholars from GW and major universities nationwide attended MEMSI’s first event, a symposium titled“Touching the Past.” In January, MEMSI received its official charter and has been hosting seminars, lectures and events ever since, including supporting the Shakespeare Association of America’s annual conference in April. “The energy that has come out of the seminar has kept going,” says Dr. Cohen. Jonathan Gil Harris’s Untimely Matter in the Time of Shakespeare, which explores material objects and their meaning in Renaissance drama. MEMSI’s goals include fostering partnerships with local institutions, presentations of undergraduate research and raising the University’s research profile in the field. “We have a world-class faculty here at GW in medieval and early modern studies,” says Dr. Details will be announced soon, but for the time being mark your calendar for Friday November 13 and schedule nothing else (it would be unlucky to do so, to say the least). Then purchase Cary Howie's book Claustrophilia, if you have not done so already. What could be better summer beach reading than a reverie on the erotics of medieval enclosure?